Although we give every effort to make our terms as simple as possible if you need any clarification please contact our helpful Customer Service Team. The below Rental Terms apply ONLY for Bookings made through our website (www.easirent.com). For bookings that you made with Easirent through other websites please refer to their advertised terms and conditions or your Rental Voucher. Our Booking Reservation systems shows you real-time availability and your reservation will be confirmed instantly. We offer a simple yet comprehensive booking process that will allow you to reserve your vehicle easily. Select Pick-up and Drop-off (if different), Rental Locations and Dates/Times. You will be presented with available car groups that you can book instantly. You can filter our results by selecting type of cover (Standard CDW or Insurance excess waiver), Fuel Type (Petrol or Diesel) and Transmission Type (Manual or Automatic). Next to each car group you will find an (i) icon with information on the particular vehicle. Prices are also presented as Daily Rate and the Reservation Total to help you compare rates. Choose your desired car group by clicking Book Now! You will be presented with all the information about your booking. Chosen Car Group, Pick Up/Drop Off Locations, Date, Time and the total amount of your Reservation. You can then complete your details such us Name, Email, Telephone, Flight Number. After you have completed your reservation you can also add extra items to your booking such as additional drivers, GPS navigation and baby seats. You will also receive a confirmation email / voucher explaining all relevant Pick-Up information and details. In order to collect your car, we require a pre-authorisation deposit on a credit card in the name of the main driver. Alternatively, you can purchase an excess waiver package with a credit or debit card. Please note, payment by debit card requires excess to be reduced to zero. For further information on our insurance terms please see below under Insurance excess waiver & Covers. If you are a UK resident using a debit card you must also agree to and pass a credit check. Easirent Branches do not accept cash payments or prepaid cards. We accept all Credit and Debit Cards as well as UnionPay. Payment cards cannot expire within the same month as the rental for insurance purposes. The vehicles displayed and models are our most common vehicles in the category. We will provide you with either this model or a similar vehicle in size and engine type. We cannot guarantee that the make or model of the rental vehicle will be the same as the vehicle displayed on our website. You can cancel your Easirent booking up to 30mins before the scheduled collection time. If you fail to tell us of your cancellation prior to the scheduled collection time or not arrive to collect your reserved rental car, we will charge you up to 3 days rental. Please note if you fail to meet the “Drivers Requirements” section below, a free cancellation is no longer valid. Driver’s Age. Min-Max Age of Drivers: 23 – 75 Years Old. All drivers must hold their driving licence for at least 1 year. Drivers aged 23 and 24 years old must have held their full driving licence for a minimum of two years and are subject to a Young Drivers surcharge of 30 GBP / 40 EUR per day. Additionally, Young Drivers must book and rent vehicles that fall under our mini, economy and compact groups (Groups A, B and C) only. Age-related charges and restrictions will apply to all additional drivers. International hirers must present a valid licence from their country of residence, their passport (or ID card) and proof of return travel. If the licence is not written in English then an International driver permit is also required. For hirers not flying into the airport, please see below for ‘Local Hirers’ terms. We cannot accept North Korean driving licence for insurance purposes, South Korean is acceptable. UK and Republic of Ireland hirers must also bring 2 proof of address dated within three months (we accept electronic copies of these proofs via a handheld device or emailed to the branch) and the DVLA check code (click here for info obtaining the DVLA check code). Points – endorsements. Minor offences such us speeding and traffic signals are acceptable up to a maximum of 6 points. If you have any bans or convictions in the last 5 years please call us before making a reservation. Third Party Liability Protection (TP): Third-Party liability covers the driver’s liability for damage to any third-party property. The hirer is still liable for the excess amount, as stated on the rental agreement. Insurance excess waiver can be purchased to reduce the excess amount. Fire and Theft Waiver (FTW): Theft Waiver limits the driver’s liability for costs incurred by fire or theft of the rental car – or damage incurred by the theft or attempted theft – up to £1500 (except luxury cars), subject to the terms of the rental agreement. Collision Damage Waiver (CDW): Collision Damage Waiver limits the driver’s liability (excess) up to £1500 (excluding luxury cars) in the event that the rental car is damaged, subject to the rental agreement. This protection applies to all authorised drivers of the rental car only. The above packages are all optional and included in the retail rate due to advertising regulations. These covers can be removed at any time on request. For more information on this, please call reservations on 08000 75 80 75. Security Deposit: A Security Deposit equal to your liability (excess) is required to be taken from the main drivers Credit Card. The Security Deposit is NOT held when Zero Excess is chosen. Local Hirer A local hirer is someone who hasn’t arrived through the airport and/or hasn’t got a return flight ticket. Local hirers who wish to reduce their excess to Zero, must agree (and pass) a credit check. Otherwise they must hold a credit card with at least £200 / €200 credit available. UK & Northern Ireland Daily Free Mileage: When you book a car online through Easirent.com you’ll get a standard, free 100 miles per day for rentals of 1-29 days. For hires over 30 days, the total weekly mileage is 500 per week. You can purchase unlimited mileage at the rental counter if you will need more. The charge for exceeding the mileage allowance is 30 pence mile, charged at the end of your rental. Republic of Ireland Unlimited Mileage: When you book a car online through Easirent.com you’ll get Unlimited Kilometres (km) on all rentals of 1-29 days. For hires over 30 days, the total weekly Kilometres (km) is 500 per week. The charge for excess Kilometres (km) is from 15 cents to 50 cents per km, depending on the car group. Van Hire Mileage/ Kilometres UK Mileage allowances start from 150 per day depending on the length of your rental. Van mileage allowances are in place for Republic of Ireland rentals too. For more information see our van mileage table here. VAT Local Tax: VAT tax to hire a car in the United Kingdom is 20%. Included in our online prices. 24/7 Nationwide Breakdown Assistance: All Easirent Branches have national assistance should the renter require it in the unlikely event of a breakdown. You will be given the number and contact details when you collect your vehicle. One Way Rentals: If the drop off location is other than the pick up and additional fee is calculated in our rates. This surcharge is included in our rates and will show at the information banner at the top of the screen when a one way rental is requested. Satellite Navigation System(GPS): £6 per day bought online/ From £9.99 per day at the rental desk. Cross Border Fee: For hirers wishing to travel from Northern Ireland to the Republic of Ireland, a £25 fee will be charged to the rental. For hirers wishing to travel from the Republic of Ireland to Northern Ireland during their hire, a €30 EUR fee will be payable at the rental desk. 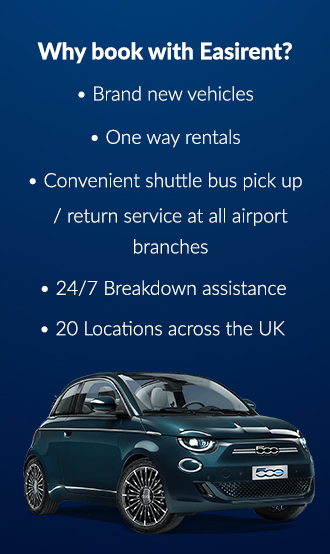 Additional Driver: £5 per day bought online/ From £12 per day at the rental desk. Free Extra Driver: From time to time, we advertise a “Free Extra Driver” as part of a promotion. If you qualify for a free extra driver, this will be confirmed via email as well as being stored in your booking record for our staff members to see on the day of your collection. If you arrive at branch and there is no record of the Free Extra Driver offer, our rental staff will contact the Social Media Team to confirm eligibility. 1. All cars are taken with a full tank of fuel. A fuel deposit will be taken for all full/full rentals. This is refunded at the end of the rental if the car is returned with a full tank. If returned with less fuel, the fuel charges will be deducted from the fuel deposit. 3. If the rental is taken on a “full-to-full” basis, the car must be returned with a full tank of fuel from a garage no more than 5 miles away from the car rental branch. Proof of this (receipt / credit card receipt) is required when the car is returned. 4. If the car is returned less than a full tank, the refuelling charge is 3.00 GBP/ EUR per litre, plus a refuelling admin fee of 9.50 GBP/ EUR. All prices are plus tax. 5. If the car is returned without proof of a local fill-up, the car will be taken to the local garage and re-filled up. All fuel added will be charged at 3 GBP/ EUR per litre, plus a refuelling admin fee of 9.50 GBP/ EUR. All prices are plus tax. *No refund for any unused fuel at the end of the rental. Unused rental days: Should the hirer decide to return an Easirent vehicle back to our branch earlier than you originally planned, we shall not refund you for unused rental days. Failure to collect: If a customer is late to collect their vehicle without letting the branch know then Easirent can only hold their booked vehicle for 4 hours or less during peak periods. If a vehicle in another category is available then you will be charged accordingly. Customers who fail to arrive on the day of collection will be marked as a ‘No Show’ and charged up to 3 days rental. Out of Hours Charge: If the Pick Up or Drop Off time is outside the Rental Branches’ operating hours there will be a £40/hour fee. DVLA Call for UK licence Holders check : Failure to bring the code will result in a call to the premium rate DVLA number incurring an additional charge of £10. Overseas Travel: Hirers can take their hire vehicle overseas. Easirent must see proof of cover in the unlikely event that your Easirent hire vehicle breaks down overseas. Easirent do provide roadside assistance, but this extends to UK main land only. Taking your easirent vehicle between GB and Ireland/ROI will incur additional charges. Green card cover fee applies if travelling to Europe. Valeting Fee: If the vehicle requires more than the usual standard cleaning on its return to restore it to its pre-rental condition, allowing for fair wear and tear, a valeting fee of max £80 will apply. Smoking Policy: We provide and implement a no smoking policy for all vehicles in the fleet. If the vehicle is returned smelling of smoke from any source, you will be charged a smoke cleaning fee of up to £300 to remove the smoke odour. Pets: You are permitted to have pets in your hire vehicle provided they are within a carrier at all times. If the vehicle requires cleaning of pet hair or odour then you will be billed for a valeting fee at the branches discretion. Hire Duration: As per our insurance regulations, hirers may not rent a car for more than 90 days in any 12-month period. Easirent reserves the right to cancel the delivery of the vehicle in case of doubts about the financial capacity of the client, outstanding debts or any serious incidents with Easirent.